It’s been two months since I returned to Canada from MCC Uprooted. I love new experiences, and our time in Arizona and Mexico was definitely new. The places. The climate. The people. The cultures. The border. The injustice. All news to me. Before going to Mexico, I had very little knowledge of Central American immigration and U.S./ Mexico border issues. I’d read a few things and watched some videos, but first-hand experience sheds a new light on any subject. I continue to be thankful for the chance to learn. How was Mexico? This question is difficult to answer. I have appreciated a few good conversations with friends who were sincerely interested in the answer to this question. One friend with an international-heart kept asking more and more questions about migration, which made me thrilled! (Although, it can be challenging to not unload a negative-mess of information onto interested friends). And I’ve enjoyed much laughter with friends after sharing about my unfortunate bathroom experience… (anyone who has travelled to a new country likely understands!). And the ice cream truck in Tucson! That was the best. But seriously, the journey was both difficult and exciting, overwhelming and eyeopening. It’s hard not to just focus on the problems I now understand. I now know that parents and children die trying to cross into the U.S. on the hot Sonora Desert. I now understand that people do not leave there homes in Honduras, El Salvador, Guatemala, and Haiti (and many other countries across the globe) simply to find better economic opportunities. They do not just want to leave… they need to leave. I have heard that the risks of crossing the border are far less troublesome for migrants than the realities of the places they are are leaving. I now understand the business end of things with privatized detention centres in the U.S. profiting from increased border security detaining migrants. I have gotten angry hearing stories of injustice and witnessing these injustices. I am more aware of the reasons for migration; We all want to be free from gang and drug violence, to provide enough food for our families, and have the opportunity to live with dignity. We should hate the fact that many people experience injustice every day. This righteous anger should lead us to action. But on the other hand, there are good things happening. Individuals and organizations are working to create change and to help those searching for better lives. During Uprooted, I was glad to learn from Frontera de Cristo, The Florence Project, The Green Valley Samaritans, and other groups trying to help those migrating from their countries. Though bad things are happening, there are good people and organizations working towards shalom. I am trying to keep a balanced approach. But what do I do with this experience? This summer I was privileged to work for Citizens for Public Justice (CPJ) here in Ottawa. When I applied for the CPJ position, I didn’t know my Uprooted experience would be directly connected to this short work term. The Uprooted team would often wonder about the details of Canada’s position on immigration and refugees. My first week with CPJ involved attending two public demonstrations: one for the federal cuts to refugee health care and the other for the insufficient response from the Canadian government towards receiving Syrian refugees into our country. Canada and the U.S. (both governments and citizens) both have a lot to learn about loving our global neighbours. I suppose I am still processing the experiences I’ve had, the people I’ve met, and the stories I’ve heard. Sometimes it feels like I am not doing anything about what I have learned. But I know that this journey will forever be a part of who I am. The ways in which I interact with the world around me will continue to be influenced by the stories of migrants searching for better lives. Returning home has been difficult at times. In some ways, I feel helpless. There’s little I can do to quickly change all of the problems. But I will have more conversations and I will support individuals and organizations working towards justice. I am encouraged by the many people working towards positive changes. I am thankful for those who live to help others live with dignity. 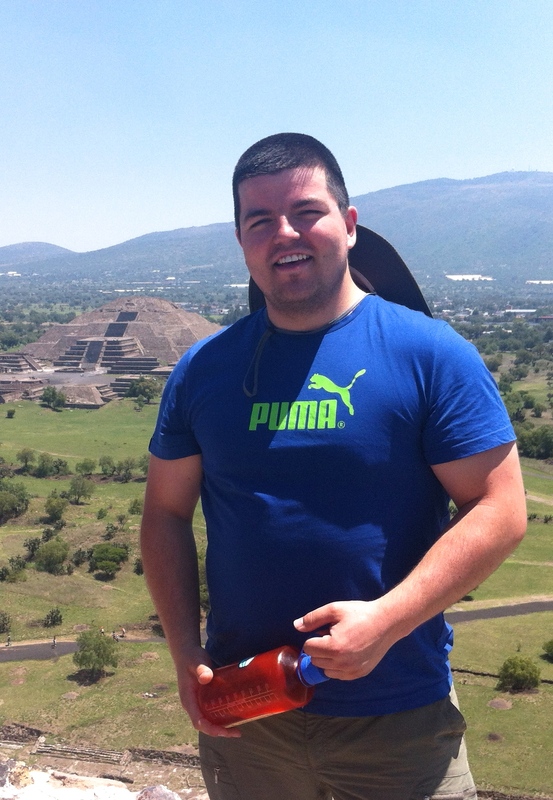 Thomas at the Teotihuacan Pyramids, Mexico. Thanks a lot Thomas! I have felt very similar reflections, especially towards our county’s policies. Thanks again for your thoughts & willingness to share them.